Apologies for having this post up later than I promised, but many of you asked me to share my travel tips. I'm no expert but I thought I would share my tips so you don't make the same mistakes I did and travel smart! I realized that it's best to bring only what you need (versus want) after packing my bags the past couple of years. I used to overpack and always bring at least one shoe for each day I was traveling, which by the way is not realistic. The best tip I can give is to always bring a pair of comfy shoes. I typically don't wear heels or wedges, one reason being because I can't walk properly with heels on. Another being I just prefer comfort and the blisters aren't worth it. I was gifted the Away luggage bags a couple of months back and was surprised at how light and practical it was. I would also look into Muji if you're looking for a new luggage, I love everything Muji. 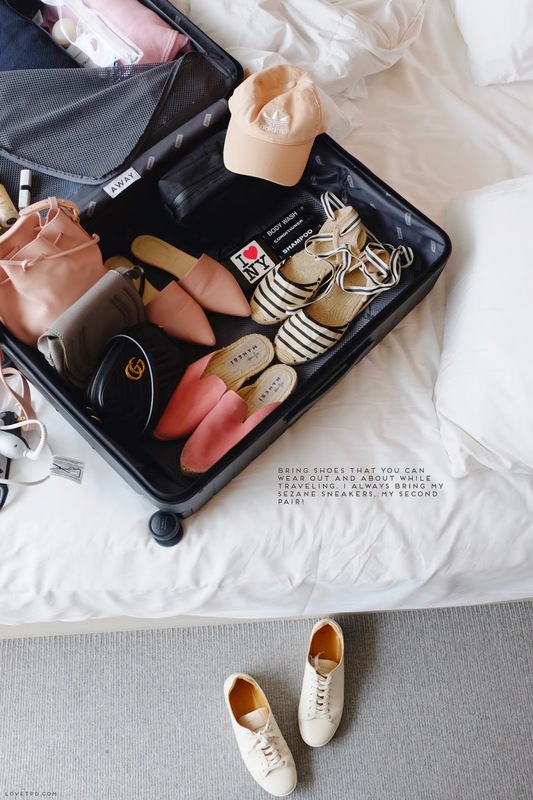 I pack all my intimates, dresses, and tops in the muji organizers which are a life saver when traveling. My friend bought me a toiletry bag which is roomy and fits all of my skincare products. I typically buy travel sized skincare products instead of full sized just in case it breaks or leaks, unless its my perfume, moisturizer or essence. One trick is to bring beauty samples to save space. Sephora has been a life saver multiple times since I can redeem my points or go in and buy travel sized products. I have a separate makeup bag which include: two different foundations, concealer, lip balm, eyeliner, eyeshadow stick, eyebrow pencil, and blush. Before packing I make sure to have a list so I don't forget anything. I bought this notepad to jot down everything and check things off when I pack it in my luggage. 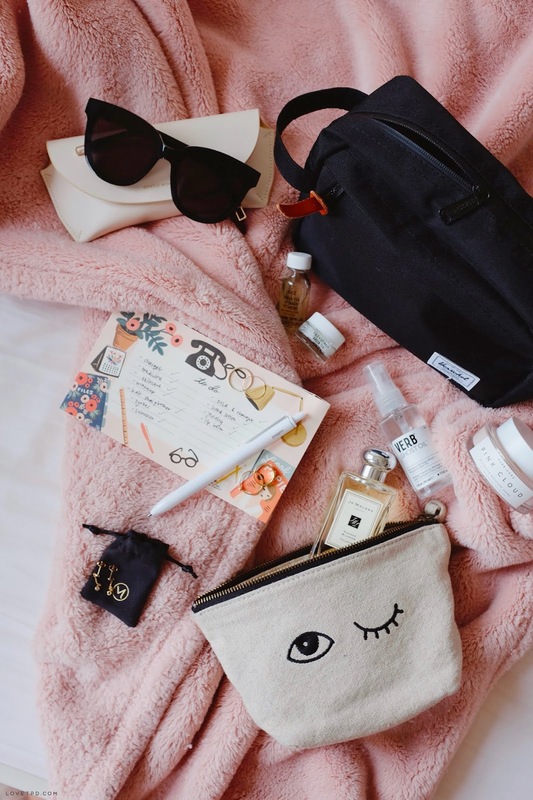 I usually bring one or two crossbody bags when traveling and one tote. Depending on where I'm traveling to and how many days, I'll make sure to at least bring one neutral colored sneaker (either black or white), one casual, and one dressier shoe. I also plan my outfits ahead of time. For example, I'll pick one or two pair of jeans that'll go with any top that I bring. I usually wear comfy clothes when going on the plane and bring at least one hoodie or jacket since the airplane can get chilly at times. A hat and sunglasses are also a must for me. When traveling abroad, don't forget a travel adapter (especially when you have multiple at home).BudgetingI like to budget my trip before going abroad, usually I'll have a set amount of cash I would like to spend per day. For example, in Paris I would limit each day to 80 to 100 euros max unless I was buying a gift or souvenirs. That would include transportation, drinks and food, and admission fee for attractions. If I went over, I would limit my spending for the next day. I cut costs by purchasing food from the local grocery shop instead of going to a restaurant, or walking instead of taking public transporation. I also bring my chase credit card when traveling abroad since I don't get charged international fees and can use my points to travel. Airfare, Airlines & Travel SeasonsI buy my tickets three to five months ahead of time, which is usually the best time to purchase since tickets are cheaper when you buy it ahead of time. I go on google flights, justfly, sky scanner, skip lagged, expedia, booking, and check hopper on my phone to check the prices or flight deals. My friends also gives me updates on flight deals they see. I usually fly off season which is the reason why I'm able to travel frequently, because I'm paying less for my hotel and airfare. Do your research before purchasing and planning your trip! I like to travel during the spring or fall, right before summertime. To be honest I don't enjoy the hot and sticky summer weather surrounded by people. It usually results in long lines for attractions and grumpy people. Fall is also my favorite season because I can bundle up in my long coats and jackets. I was able to get roundtrip tickets from DC to Thailand and Japan for about $850 (give and take) because I bought it ahead of time. Also, checking the airline's website directly or signing up to their e-mails can give you updates on their deals. Reward ProgramsI currently have frequent flyer reward programs with Southwest, Icelandair, and United Airlines. I like to take Icelandair when traveling to Europe because I love how roomy and comfortable it is for an economy ticket, and the flight attendants are very nice. Just to clarify, I fly economy for the most part except for the few occasions when my trip is sponsored. Trust me...I wouldn't be able to afford (or want to) spend $1500 for a round trip ticket for a domestic flight. Let's be real, I got bills to pay. I racked up enough miles on Icelandair and I was able to use it towards my recent Iceland trip, I got $100 off the ticket price. You can also use it to purchase meals onboard. I only paid $350 for my roundtrip ticket to Iceland, direct flight. Icelandair sells cheaper tickets when you have a layover in Iceland, which in my experience has been short and I'm always happy to drop by Joe & the Juice while waiting for my flight. I use my miles I accrued with United Airlines to log into their WiFi instead of paying for it. One thing I like about Southwest is that you get two bags for free and there are no seat assignments. Paying for luggage when flying domestically seems like a scam to me, so I typically just pack everything in my carry on luggage. When flying internationally, airlines typically allow one or two free bags to check in. Unless you're flying to neighbouring countries in South America or Canada from the US.One thing I always tell my friends and family is to sign up for ebates. Especially if you like online shop this is a great way to earn money to literally shop. 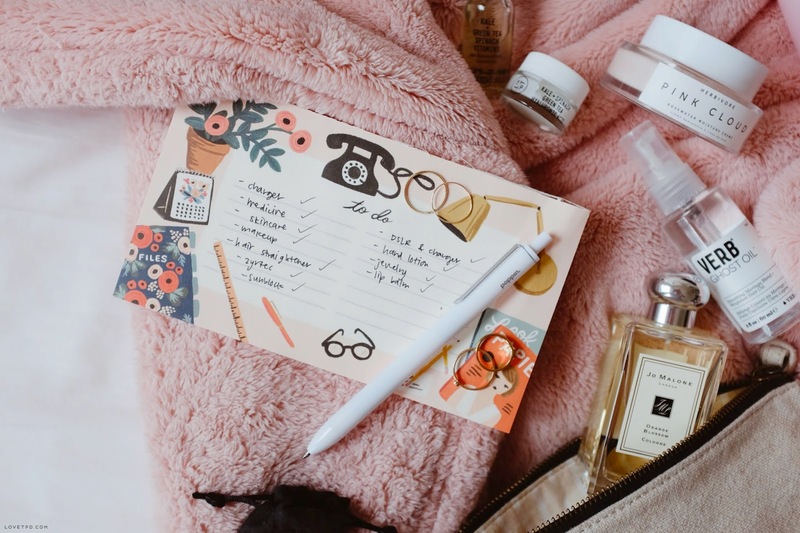 You earn a percentage each time you shop at your favorite shops like Sephora and Madewell. Especially during the holidays you can earn up to 10-20% cash back for your purchases. You can also get cash back on expedia and other travel websites. I signed up in 2010 and so far I received almost $1100 cash back. You also receive $25 each time you refer a friend, you can sign up here - it's free!Airbnb or Hotel?I personally love airbnb, but did have my fair share of bad experiences. 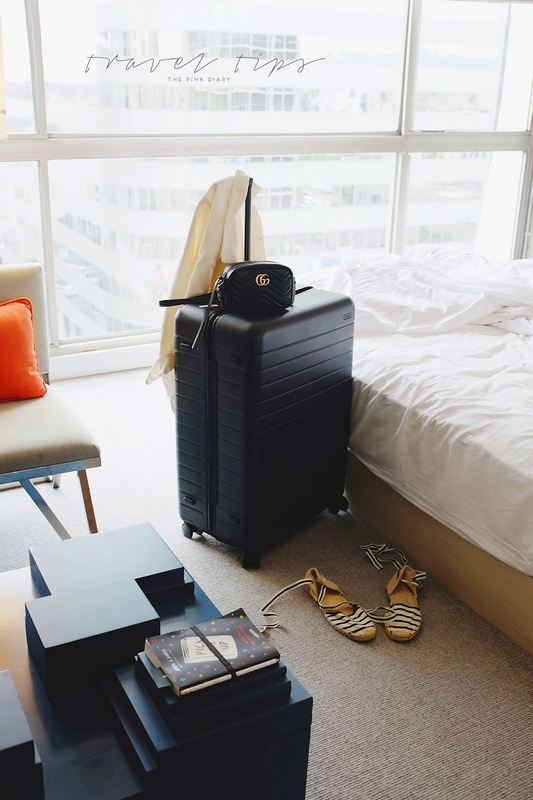 Since most airbnb's are not professionally managed you sometimes don't have the cleanliest spaces, but you usually have more space than your typical hotel room for the same price. I had a really bad airbnb experience when I first visited San Francisco, which is probably one of the reasons why I didn't enjoy SF as much as I could have. When I visited for the second time in April I stayed at a hotel and I was able to enjoy my stay in San Francisco. Maybe I just have bad luck when staying at airbnb's in the west coast, but when I stayed at an airbnb in LA the host left one extra toilet paper that had mold growing. The room was also much smaller than I expected. One thing I realized about airbnb was that pictures are not always accurate, and sometimes rooms are a lot smaller than I expected. Airbnb's are great for those that love cooking because they usually come with a kitchen since you are renting out people's rooms/homes. In some occasions, there are hidden fees or extra charges when traveling abroad. When I stayed at an airbnb in Barcelona and Italy I was charged extra for toiletries and paid a tourist tax. I also had to give a cash deposit and charged extra if I spent over a daily electricity limit when I stayed at a villa in Phuket. However, I've had amazing experiences as well. I love airbnb's in Paris because they have a personal touch and you're able to experience your stay like a local. Many hosts have a guidebook that has a list of things to see, eat, and explore in the neighborhood or city. I've met amazing hosts along the way and would stay in their place in a heartbeat. I do like that you can communicate with the host directly and they're often flexible with check in and check out times. You can also refer friends and receive credits to use on your next airbnb stay. Get $40 off your first stay if you sign up here.Hotels are great, especially if you had traumatic experiences with airbnb. There are always people in the front desk who can help you instead of waiting for your host to respond back to you. I don't think I've had any horrible hotel experiences (yet, fingers crossed) but sometimes the rooms are smaller and pricier compared to airbnb. These days I've been leaning towards staying at a hotel just because I can interact with the staff and can request a different room if there's a problem. Overall, depending on what you want I would go with what best fits your need. Hope this post was helpful! If you have any tips or any questions please comment below and I will answer you questions! 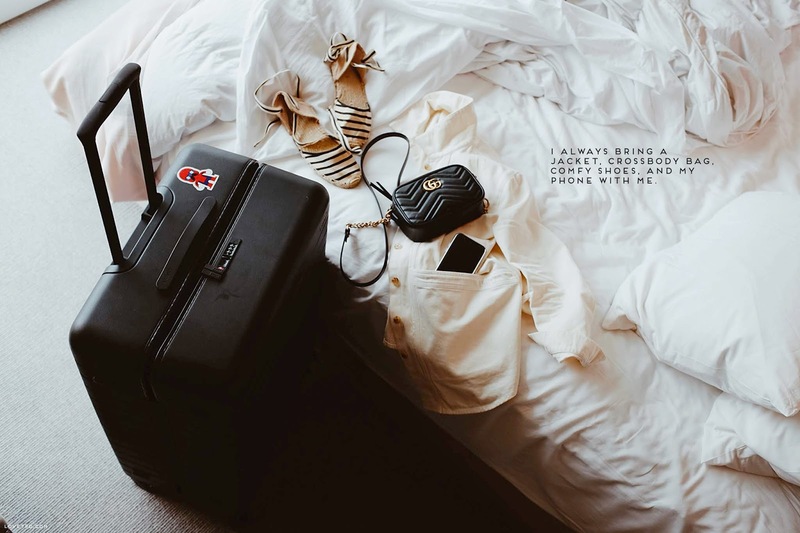 This post is not sponsored by any of the brands or websites mentioned, I just thought I would share some of my travel knowledge! 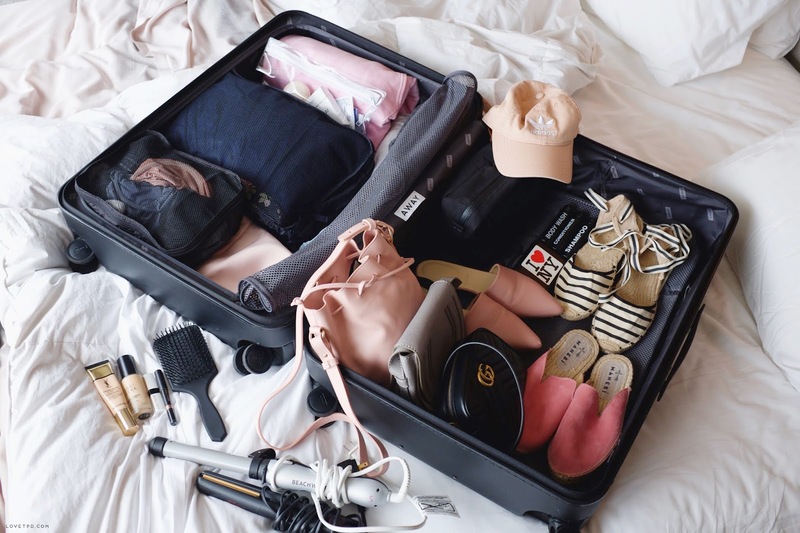 Great article, thanks for the tips,traveling light is always a good thing.